The CRS was brought in specifically at the request of our Group S drivers, who have expressed strong interest in taking it. However, to insure sufficient participation to cover the additional costs of holding a CRS, upper-level intermediate and advanced students, as well as instructors, are also welcome to apply. Group S members, PLEASE READ: There is no separate open-track Group S program at this event. In its place, GS drivers have two options: 1) Sign up for the Club Race School. The two-day CRS fee is the same as we charged last year for a normal three-day GS weekend. 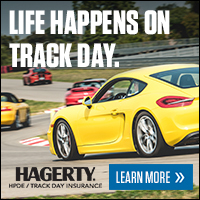 You have the option to add the open-track day on Friday for an additional charge of only $100! Alternatively, 2) sign up as an Advanced student for the weekend. Because you are a GS driver running in Group 2, you are signed off by default to run without an instructor, and will be able to take additional sessions in the instructor group for $50 per session (payable at the track). Your last option is 3) Sign up to drive Friday ONLY for $210. Club Race School: 4-5 sessions. Club Race School (G1): $675 (Saturday-Sunday); Non-members: $800. Optional Friday open-track add-on (members only) is an additional $100.